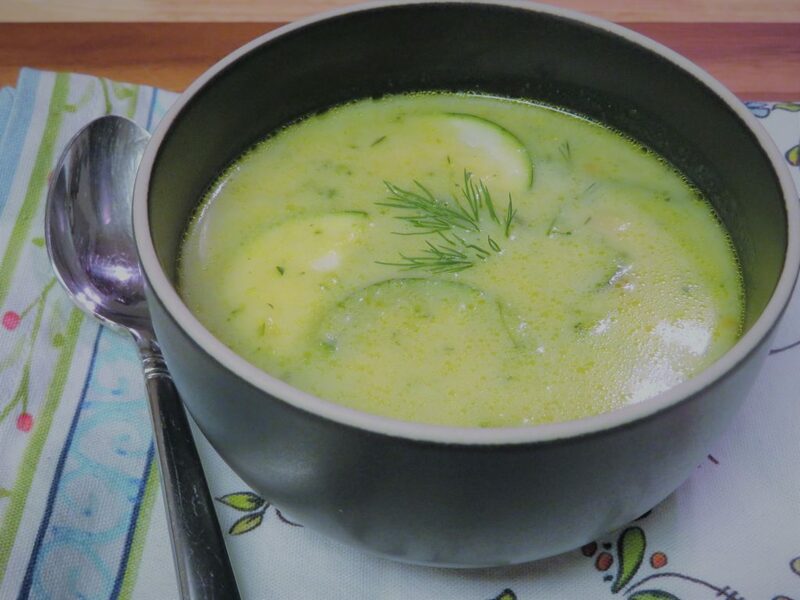 If you like zucchini, you will love Creamy Zucchini Soup. This tasty soup will help you make an easeful transition from summer to fall. And another thing about this dish that is great is that it takes no more than 20 minutes to make, start to finish! During September and October, and even into November in some places, zucchini is being harvested before the first big frost. As the nights are getting cooler in many parts of the country, this warm, gingery vegetable soup is a perfect accompaniment to a veggie burger, a pasta entrée, or a sweet potato stuffed with black beans! As cold and flu season approaches, one way to keep your immune system strong is to eat hot soups spiced with fresh ginger. Ginger is one of the key medicinal herbs used in Ayurveda. Ginger is excellent for the digestion, as it increases agni, the body’s digestive power. It also clears ama (toxins) and is anti-inflammatory. In addition, ginger supports the lungs and helps clear phlegm from coughs and colds. Clearly, cooking food with fresh ginger has many health benefits, and the spice has just enough heat to give many dishes a needed flavor boost. I can understand why some readers will want to replace almond milk in this dish with dairy—whether that means whole milk or a few tablespoons of cream. However, I wouldn’t advise this for anyone who suffers from seasonal allergies. Dairy will increase mucus, so keep this in mind as you plan your shopping list! Welcome autumn into your homes with this quick and easy Creamy Zucchini Soup! This soup is best when made with a homemade stock. (If you use a boxed stock, you’ll want to taste the soup before adding more salt as indicated in the ingredients list.) This dish is even more delicious with fresh almond milk, if you happen to own a Vitamix or another professional grade blender and can make your own. 1. Wash and slice the leek. Cook the leek slices in the ghee or oil in a 5- or 6-quart soup pot over a medium heat, stirring occasionally. 2. Wash and thinly slice the zucchini. (You can use a food processor, if you have one.) Once the leeks have turned golden, add the zucchini to the pot. Cover the veggies with stock and bring to a boil. Adjust the heat and simmer for 5 minutes or until the zucchini is tender. 3. Add the dill, ginger, and almond milk. Add salt or more dill to taste. Serve immediately with fresh dill for garnish.